The original true Filipinos have long been gone and obsolete in history which every new Filipinos that has been born in the present generation have no any knowledge of. Truly colonial rules and rocks! However, I do not say that colonialism is bad and evil, but what I would like to point out is that it hijacks the growth and flourish-ment of pure homogenous blooded culture or race that will supposed to bring a distinct pure strong one race and culture that will give a clear accurate trace of origin of the race and culture or a pure clear and accurate history. Colonialism hijacks ones’ pure culture through hybridization or merging their dominant colonial genes and culture on the conquered race so that they could Lord or rule over them in genes and in culture over a lifetime. It is a way to erase the origin and pure race of the conquered race while preserving their dominant genes and culture. This is a great advantage for them, but to the conquered race a great terrible disadvantage because their once pure race lost real identity and could no longer tracks back accurately where they came from and who really they are. From this standpoint, the true real identity of real pure blooded Filipinos could no longer be track back accurately and lost forever in space due to multiple colonization of the Filipino race, wherein now the most dominant of all Philippine conquerors are the Spaniards whose genes (mestizo, mestiza) and belief system (Christianity) still rules and lords over the Filipino race; not to mention that the country name “Philippines” was derived from the name of the Spanish King then – King Philip. 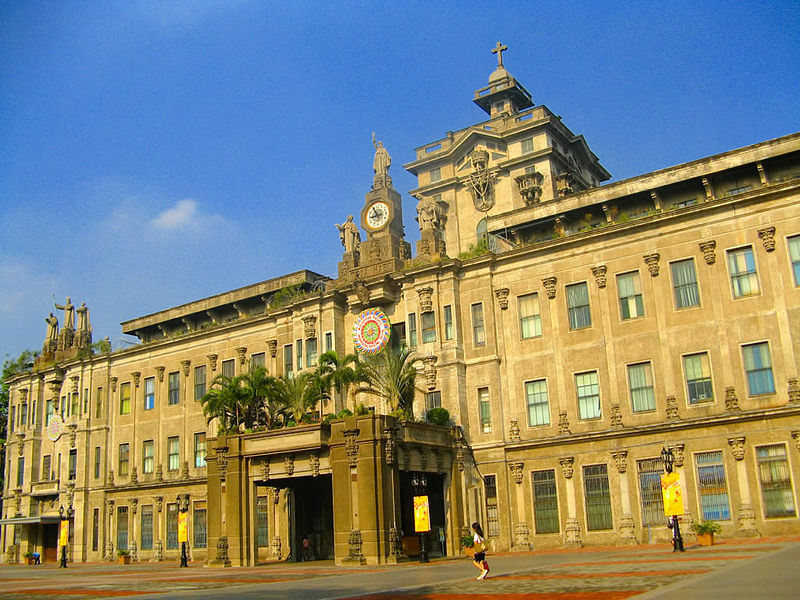 Moreover, one great example is this quadricentennial or 400 years old Catholic Dominican University in the Philippines – the University of Santo Tomas (st. Thomas Aquinas) or widely known as UST –which takes pride to have still strong colonial strongholds on the Philippine archipelago for 400 years in controlling and influencing the hybrid race Filipinos to continue the legacy of their great conqueror (the Spaniards) and uphold it and be proud of it in their colonized hearts and minds. It is actually a disaster on the pure true race of Filipinos but a great advantage and victory to preserve Spanish genes and culture on the Philippine land. Therefore, is it worth a pride to take pride the victory and triumph of this colonial university as the oldest university in Asia and in the Philippines, which every Filipinos could be proud of around the world? The answer depends on the present day Filipinos. (4) and, a Dominican Friar, whose sculptor’s model is Fr. Rolando V. Dela Rosa – the current president or rector magnifus of University of Santo Tomas. The sculptor monument stands 10 meter high sculptured by the Filipino artist Ramon Orlina.